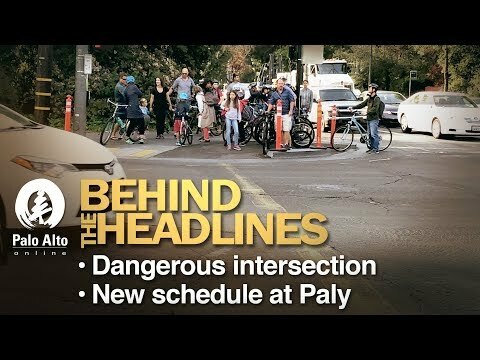 Weekly journalists discuss the recent changes at the intersection of Middlefield and Embarcadero roads which parents say has created dangerous road crossings, and the approval of a new schedule at Palo Alto High School, which will allow students to start school at a later time. Why is anyone surprised by this. The changes present a danger to children but that doesn't matter to the architect of these fiascoes, Josh Mello, Palo Alto's chief transportation official. Look at the mess created in front of Jordan Middle School, on Arastradero heading into Gunn H.S. and most recently the Ross Road debacle. The objective is to eliminate automobile traffic, plain and simple, regardless of the risks involved to kids on bikes. They're creating problems for not only for kids on bikes but also for pedestrians and drivers wherever they come from. This is one of only 3 exits from 101 and a direct route to Stanford so this intersection serves a lot of non-residents. To spend tax dollars on instructions for crossing the street is not only laughable, it ignores the obvious reality that people not living in PA or attending PA schools drive on our roads. Are we now going to send out instructions to the world? And where's the common sense in eliminating the right turn lane for traffic southbound on Middlefield? All that does is back up traffic even more.